Which camera should you buy, newly announced Canon G3X camera or Canon G1X Mark II camera, take a look at the detailed specification comparison review below and share your thoughts with us…. 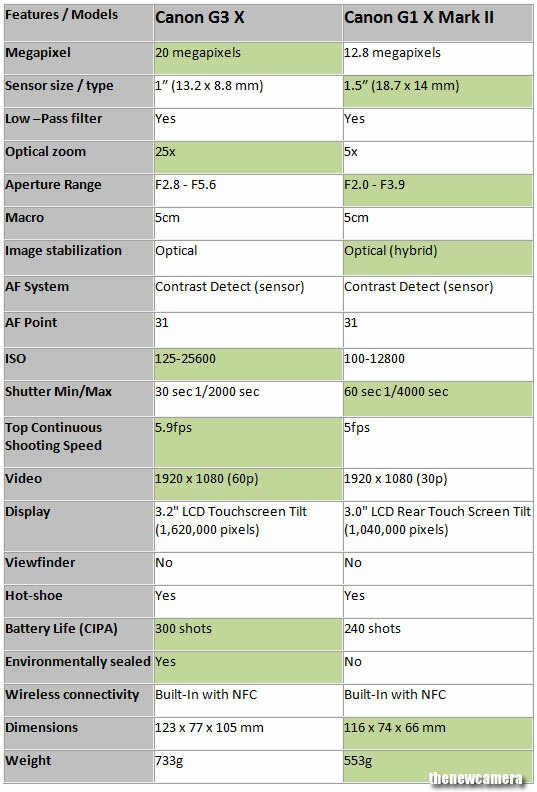 Canon PowerShot G3 X vs. Canon PowerShot G1 X Mark II Specification Comparison Table. Sensor: The canon GX3 X camera features 20 MP 1″ sensor and the Canon G1X Mark II features 12 MP 1.5″ sensor, that clearly means that the photo diodes of the Canon G1X Mark II are big compared to the Canon G3X camera, large photodiodes collects more light and in-return you get better low-light images. But both the sensors are bit different, the Canon G1X Mark II camera is build by Canon itself and Canon G3X sensor is developed by Sony, (same sensor as of RX100 M3). Lens: The Canon G3X features a 25X optical zoom lens on the other hand the Canon G1X Mk II limited to 5X optical zoom lens only, the other noticeable difference is the aperture range of both the camera, the Canon G1X Mark II features bright optical zoom lens F2.0 – F3.9 on the other hand the ISO range of the G3X is limited to F2.8-F5.9, however we have to keep in mind the G3X has more lens elements inside it compared to the Canon G1X MK II camera. More ISO Range – Despite of having small sensor and more resolution the Canon G3X offers more ISO range, so we do expect that Canon G3X will perform better under low-light condition. However we will publish high ISO test images of both the camera as soon as they became available. Both camera features Hybrid image stabilization, the system selects from Normal IS, Panning IS, Macro (Hybrid) IS and Tripod modes. When shooting video, the system selects from Dynamic IS, Powered IS, Macro (Hybrid) IS and Active Tripod IS modes. Auto-focus system – Both the compact camera features same type of contrast based AF system with 31 AF points. Fast Continuous shooting speed in G3X – The Canon G3X not only features more resolution but it also features bit more continuous shooting speed. So if you are a sports shooter and need a compact camera than for sure the Canon G3X is best for you since it offers you more optical zoom, ISO range and burst rate. Dust- and water-resistant – Canon G3X is the first Canon G Series compact camera to feature weather resistance sealing, the camera G1X Mk II doesn’t have such type of sealing. The weather sealing let you free to use your compact without worrying about outdoor weather condition. Verdict: I will pick Canon G3X as clear winner, since the camera features more optical zoom, more ISO range and and bit fast continuous shooting speed… we highly recommend you to buy Canon G3X camera.